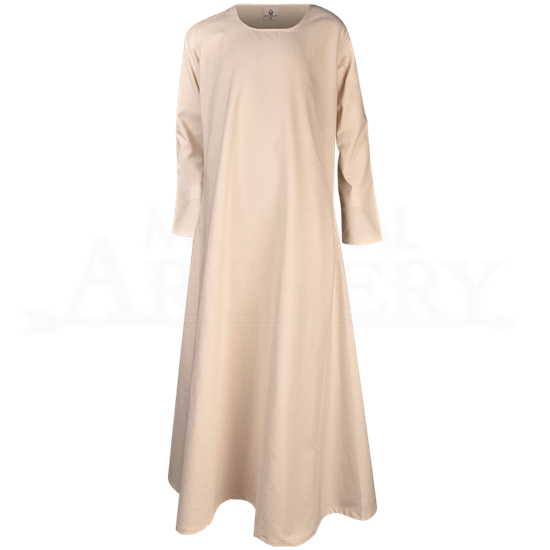 Light yet durable, the Kids Lotte Dress is the perfect starter for young ladies interested in historical reenactment or fantasy dress-up. This cream colored cotton dress has a classic fit great for layering or for wearing on its own. The full length dress is slightly flared into a mild A-line shape. The sleeves are long and fitted, and the neckline is round. Accessorize this kids cotton dress with a medieval belt, or wear it as a chemise underneath other medieval clothing.